1 February 2003 Banquet: Ringknocker, Cookie, me. Here are my previous rugby journals: Rookie season, Second, Third, Fourth, Fifth, Sixth, Seventh, Eighth and Ninth. Funny thing. When I finished my last match last season against Frederick “B” in early November, I walked off the pitch thinking, “This is still great. I’m still enjoying this. Even after a lay-off, it’s still fun. 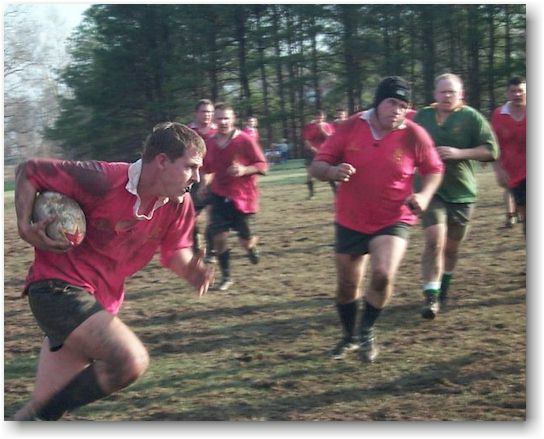 Too bad the season is ending!” Then, once I got home, the natural forces of age, laziness, church responsibilities, family activities and other creative outlets took over – and, once again, I began to dread the February return of rugby. I did no practice or fitness during the off-season. We took my nineteen-year-old son Ethan to college in Idaho at the beginning of the year, and arrangements for that took a lot of my mental processing power. Then, in January and February, my daughter Meredith began cheerleading, and I became the squad dad, providing the sound. (It’s deeply biological.) I have way too many irons in the fire. As far as Western Suburbs is concerned, I continued nearly daily updates and additions with the website, rugbyfootball.com. The statistics I have from September to mid-February indicate that a lot of people are viewing it – about 620 individual clients per day, on the average. Pretty good for a U.S. rugby website. Also, I purchased a new set of a-side team jerseys, the old ones becoming dry-rotted. Put together an order for Boathouse jackets, too. And while I didn’t do a full-blown banquet slideshow, I did provide visual entertainment for that event in the form of automated slide shows – the “Year in Review” kind of thing. I also did the reservations for the Dustbin, and am putting together an individuals order for jerseys for spring. So, once again, even when I’m not doing anything I’m still doing things. I suppose were I to entirely give up all rugby activities I would feel a loss and become restless. But, as seems to be the eventual case with me and my hobbies, I am becoming less mentally involved with rugby. Once, I was running laps with Jeff Gravatt – the fellow seen leering behind my shoulder in the photo above – he confided that with him it was like a switch being turned on, then off. I know very well what he means – I can feel my switch being turned off. I didn’t especially enjoy the banquet. Devoid of the thrill of having to do a live slideshow that is very much like a performance, I became rather bored. I doubt that I’ll attend next year’s. And I read some of the stuff I wrote in my rookie season journal – wow, was that really me? How long ago those days seemed, when I was but 42. We’re having a hard time getting things rolling, mainly on account of the unavailability of Dunn Loring and a lot of snow. Practice was supposed to start on 8 February, but didn’t. We had one session that I couldn’t make because of Meredith cheerleading practices – sprints and running on a high school track. It appears that practice doesn’t really start until our first night in the Dustbin, 25 February. ARRRRRR! GGGGRRRRRR!!! Rugby! Yeaaahhhhhh, baby! Woof! Woof! Rugby!! Woof! RRRRUUUGGGBBBBYYYY! Actually, I wimped out and didn’t attend. Set me free, why don’t you rugby? Get out of my life, why won’t you, rugby? I was more up for this than I thought. My fitness wasn’t entirely there, and I didn’t do everything, but I wasn’t as slow and tired as I thought I might be. What ended my practice session early was a mild case of stomach flu of some kind. Rugby, stomach pains and diarrhea don’t mix very well. (Also, sucking in cold air was making me cough a lot.) What I really needed at the end of practice was a nice, hot mug of herb tea. What I got was a Coke at the Hop Frog Tavern. We had a bunch of guys from West End RFC – the local high school club – attend, and that was interesting. Anyway, the first practice of the spring 2003 season was an encouraging start – bathroom trips excepted. Anyway, I planned to go to practice tonight but couldn’t, because I had a church thing come up – I had to visit one of my former scouts in a Fairfax County probation house. Bummer. (Bigger bummer for him than me.) So I dropped in at the end of practice after I go through and watched a truly sadistic exercise: guys giving each other piggy-back rides across the dustbin. Whoa. Watching forwards who approach 300 pounds each doing this was interesting. And I am very sorry I didn’t bring my camera. Anyway, the scrum sled is now in the dustbin, ready for use. …and we used the scrum sled a lot on Friday. In fact, most of the practice was involved with it since we were learning new plays. It was the first practice in a long time that I did from beginning to end, taking part in everything. Just like the old days! Anyway, my upper legs were very sore the next day. Rugby match #70. It was a nice, warm, sunny day in Winchester, and I played two thirty-minute periods. I felt much fitter than I was the night before at practice; I guess the difference is not running around in the cold. The pitch was nice: very little mud and a generally soft, cushy ground - a far cry from the dustbin’s hard-packed earth. The a-side won their game 59-3; we won ours 59-8! No try, although an opportunity nearly presented itself. It’s all in being in the right place at the right time, or making yourself so, and I wasn’t. But… we did a big 10 meter pack push into Winchester’s try zone off a lineout that I was heavily involved in – at least I was tired when it was over! – so that counts, I guess. It was a good game for me but perhaps not one of my better ones. Got my hands on the ball a few times. Still… all too often it seems like everyone else is in full-motion when I’m in slow-motion. The scrums were pretty horrible. Winchester had a new fellow on the front row who, under pressure, would collapse the scrum. So we played the second half with no-push scrums. Afterwards we went to an Irish bar in the nice historical district of Winchester – attractive little Virginia city – the guys drank green beer, and I blew home to attend a cheerleading awards party with Meredith and her squad, where I was presented with an award for being the “Squad Dad.” While a try would have been nice, this other thing means the world to me. We did some new drills involving defense out of a ruck - tight fives are "guard dogs" - and generally a lot of running around. When I came time for full contract/full pace, I did some jogging around the track outside, it being a really nice moonlit night. (The other thing was, the fingers of my right hand are now sore from doing hoisting practice and playing. So I was avoiding heavy, smashing contact.) I must have jogged longer than I thought, for when I came back to the dustbin we started stretching! So I must have ran a few miles. Anyway, good practice; I kept moving the entire time. Emphasized scrummaging at the start. At one point, in a live scrum, I pushed so hard that I saw stars and gave myself a headache! Then the boys did opposed scrimmaging, which, on the hard earth of the dustbin, is torture. I passed on that, popped some Ibuprofen and did some running outside. The most interesting thing about this practice session was my breaking into Crazy Eddie's truck in the parking lot! At the start of practice he mentioned that he locked himself out of his truck. Seeking to help, I began looking for a clothes hanger that I could unfold. I didn't find one, but I found something better in a utility room: a long steel flat line, exactly suited for the purpose. So after some maneuvering around with Eddie holding the flashlight and doing repeated prayers (! ), we got the door lock lifted and Eddie got into his truck. Naturally, the question for me was, "How did a Mormon learn how to break into cars?" My play was okay, but it was only okay. Getting around in that squishy ground was hard. I forced a turnover in the scrum at one point, and we had a good pack try in another. Afterwards we went to an Irish bar in Aquia, where I bought a Quantico Marines tee shirt. The bar had interesting décor on the walls, which seemed to sum up my life: Civil War reenacting, the Marines and rugby. Here I am struggling to stay in support of the ball carrier! This was a dinner party that Kelly Watkins set up for our Japanese scrumhalf Aki, who departs for Japan at the end of next month. Since we gave him an interesting welcome when he arrived in spring 2000 (two of our guys met him at the airport with flowers and Twizzlers), we gave him a memorable send-off. Being at Morton’s, it wasn’t cheap – but it was a lot of fun! In fact, it was one of the social highlights of my rugby career. I ate and ate; everyone else ate and drank, and we all had a good old time. We were situated in a private room that had Sinatra songs piped in. It was a massive feed for me – and then I had another the following evening on a business trip to Dallas – which is why I didn’t attend practice that week. 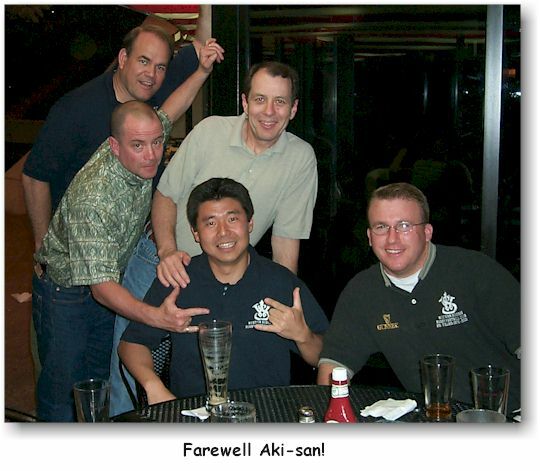 Farewell, Aki! I didn’t attend practice last week because of a business trip to Dallas – where I strapped on the feed bag. Back at the dustbin, this was both a good practice session and a bad one. Good in that we did some interesting variations on the usual drills. 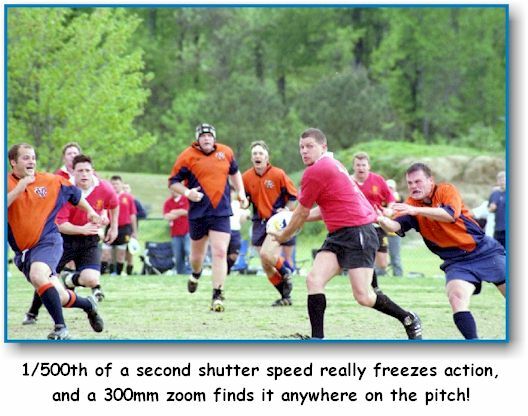 One involved performing zones of defense when an opposition scrumhalf takes the ball out of a ruck. (We don’t go over this stuff near enough, in my view.) The only problem is that there is a major difference between guys doing drills at practice and the chaos of a match! But… it’s good to know that we’re getting drilled to recognize that as soon as the scrumhalf puts both hands on the ball the ruck is over and we can attack. It was a bad practice session in that I was really listless for it, pretty much just going through the motions. Must be spring fever. I did nearly everything, until we did a sprint around the dustbin. Cutting hard corners on that hard-packed earth made an ankle sore. So, I did some jogging outside for the short while that was left of practice. After our starting lap we did the most exhausting and protracted lineout practice I can recall since my first season, when Fef was bruising my upper arms. I must have done between 20 and 30 lineout hoists, one after the other without much time to recover. What’s more, it was quite warm in the dustbin, so it was pretty sweaty. My right biceps is very sore, and so are my fingers. Afterwards we did some scrummaging. That left about a half hour in practice, when an unopposed scrimmage was called for. Seeking to lose some weight this season - it hasn’t happened yet - and not wanting to stand around cooling off while waiting to be put in, I ran laps for about 25 minutes. (Also, I’m not a fan of banging on each other on that hard dustbin floor.) So it was a full practice for me. Hop Frog Tavern afterwards; I sure hate the later 7:15 start time we’ve had so far. Eating dinner at 9:30 will do nothing to help me lose weight! An interesting thing happened at work the morning after. An attractive young woman came into my office for a signature on a form, and looked around at the various rugby photographs and posters I have on my walls. She asked, “What game is this? Rugby?” I replied yes. After a pause she then asked, “Aren’t you too old to be playing that?” A good question – one I’ve been asking myself. A great rugby day for Western Suburbs: the a-side won their match 55-5, the b-side won theirs 67-7 and we won ours by 19-10 in a come-from-behind victory. 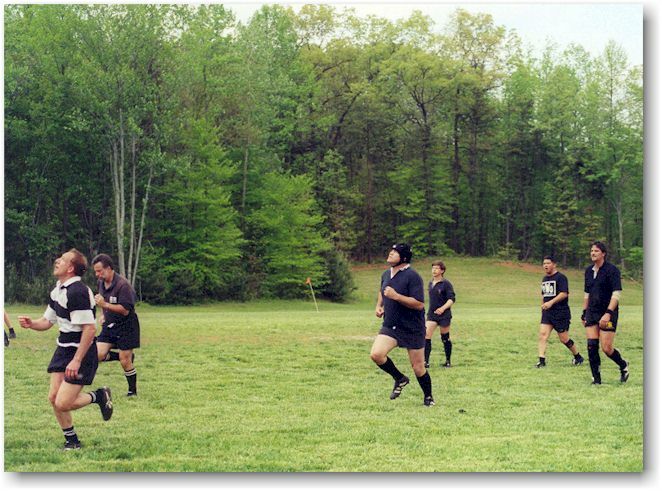 We brought about 50 guys two hours south to the Virginia RFC pitch in Shadwell (near Charlottesville) – it didn’t look like Virginia had a b-side. I was told eight guys showed up from Blackwater. Anyway, it appeared that fresh Blackwater players – and their jerseys – made it for the third match, so we weren’t facing tired players. At least it didn’t seem like it; it was a challenging game. I played two thirty-minute halves and got my hands on the ball more than usual in this game. And we drove the opposition scrum pretty much every time we wanted to. At one point I caught a slow, arching kickoff – and then got nailed hard by at least two guys. But I was able to go to ground with the ball and place it, retaining possession for our side. But getting up, I saw stars – a first in a match for me. I caught another kickoff, too, and passed that backwards. And I’m not exactly clear on when it happened, but at some point – in a maul that fell to the ground, I think - my neck got wrenched and I had to take a few seconds lying on the ground to make sure I was okay. Anyway, I had a headache on the way home and now (Sunday morning), I’m feeling pains in my neck. It’s stiff and hard to turn my head around. I think I may skip practice on Tuesday, just to be on the safe side. But – people were telling me it was one of my better games. It’s hard for me to tell, sometimes, I am at such a mediocre level. No first try in this match, but that kind of goes without saying. Charlottesville is a great college town, brick colonial-style buildings, flowering trees everywhere – just a great place to visit. I’d like to live there, in fact. I did skip Tuesday practice; my neck was still a little sore. After a real “captain’s run” (Shamrock had us doing odd things – high knees, feet back, long stretching walks - on the grass outside of the dustbin) we retired therein to do some forwards mauling. I was trying to keep from stressing my neck but really couldn’t do it in this drill. Consequently I got my head torqued – and it started hurting again. Fortunately we then switched to some lineout practice, and then scrum sled work, and it stopped actively hurting. (Active hurt: Defined as something so painful that it blocks concentration from doing other things.) Finally I ran laps outside in the cold, breezy evening for about twenty minutes while everyone else did “unopposed,” as is my wont. Practice over, we went to Hop Frog Tavern. My pard Kelly Watkins showed up, and the conversation was just as satisfying as this practice session was. We were supposed to play three matches on 4/12, but Signal Hill Park in Manassas called at the eleventh hour on Friday and told us the pitch was closed due to rains during the week. Drat! Also, we were supposed to play George Mason University tonight – but they told us they lost their pitch to soccer players. Double drat! No match this coming weekend due to Easter and a wedding. I don’t know why a wedding should preempt an entire club’s activities since the entire club wasn’t invited. And since I’m not playing Reds in the playoffs on 4/26 and 4/27, this season is sort of petering out fast and I’m playing less rugby than I wanted to. Kelly Watkins had a little going away social for Aki (who is returning to Japan at the end of the month) this evening at T.G.I. Friday’s. Matt Clark and his girlfriend, Borell, Kelly, Aki and me and my wife Cari attended. It was a nice, warm evening, and we sat around and chatted about rugby past, present and future. We had two 25-minute scrimmages on our new "pitch" this evening - a field located by Rob Sanders and investigated by me. A few miles down the Parkway from me, it's owned by the Fairfax County school system – as far as I could tell - and is big enough for a full-size (or nearly full-size) pitch. It's better than the Dustbin, but still, getting tackled on it is still rough going! Boy, what a difference 24 hours makes; it was warm the night before at 46 degrees with breezes out on the pitch. Matt Clark made a wonderfully astute observation as we all sat in a circle stretching: “Look at all these happy faces. Nobody wants to be out here.” I played the first half, and it was okay. We had about 43 guys out and a bunch at Hop Frog Tavern afterwards, where Kevin "El Jefe" Corry announced his upcoming wedding and another lock and I had a conversation about El Santo, the masked Mexican wrestler. I attended Saturday's two matches with Kelly Watkins. The Reds lost to Virginia in the first match and beat Olde Gaelic in the second. The following day they beat PAC "C" and so came in fifth place overall (in a field of eight). Not having played any rugby for weeks because of weather and logistics-related cancellations, I was pretty disinterested in driving 2 ¼ hours south to witness this. As far as sports go, I am much more interested in being a participant than a spectator. But as Kelly agreed to travel with me and provide conversation, I went. Also, I wanted to give my Nikon N65 (with the telescopic zoom lens I got for Christmas) a workout. I suppose my presence was appreciated as I got some great photos - much better than I can get using the Kodak digital I normally use. I only wish I had some of myself like this! So there it is. I went and supported the club, rah-rah. I hope we don't have a cancellation next week for the Alumni Match - I'd like to play some more before writing finis to this season! We're probably looking up at the ball which has been kicked into touch or something. At least I'm running! But still, let's face it, I'm a tired old donkey in Old Boys black. And so, another season - my tenth - concludes. I have now played 74 matches (I could the two major organized scrimmages because the effort is about the same). This was curious season in that I began it figuring it would be my last and ended it with regrets over not having played more. I have suggested to the coaches and officers, however, that I plan to retire at the end of the year. We'll see how well that goes. 1. Finally got to beat Quantico! It's always fun taking part in a defeat of one's alma mater (the United States Marine Corps). 2. Except for the Alumni Match (in which it can be said that the club wins), my games were all wins! 3. Much improved (but more expensive) photography using the Nikon N65 with the 300mm telephoto zoom lens I got for Christmas. 4. My investigations leading to our use of the "Quarry" pitch, which is only about 2 or 3 miles away from where I live. 6. What practice I attended (fewer than in any other season, I think) seemed to be more fun than last year. At any rate I was more up for it. 1. Weather-related cancellations. I really wanted an April match against USUHS. 2. Only played four games and a scrimmage. 3. No try, but I have come to regard this as the forlorn hope. 4. Field problems with the Fairfax County Parks and Recreations Department. A lot of my logistical support of the club this past season was in the form of trying to find us a field to replace Dunn Loring, which we seem to have lost and then regained. And now, Summer. Days of hammock, pool, pizza, rented videos and family life. 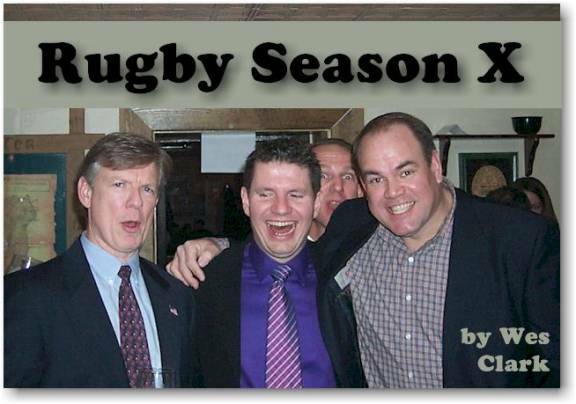 Click here to go to the Season Eleven Rugby Journal.